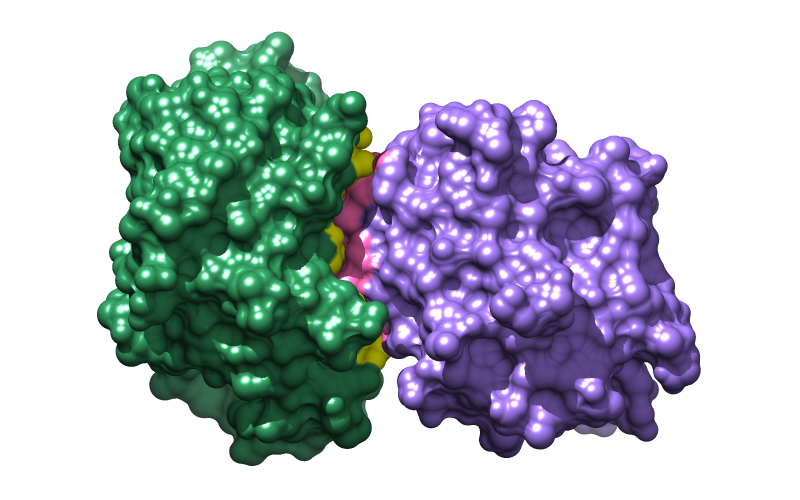 The structure contains porcine pancreatic trypsin, chain A, complexed with a trypsin inhibitor from soybean, chain B. 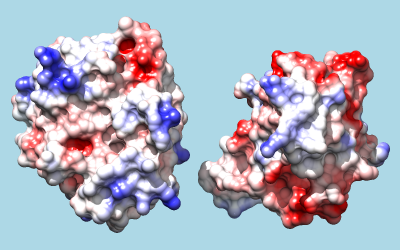 Move and scale (zoom) with the mouse to see how the two proteins fit together. Resize the window as desired, either by dragging its lower right corner with the mouse or by using the command windowsize. The window dimensions define the aspect ratio (width:height) of output images, but image resolution can be specified independently when an image is saved. An 800x500-pixel window was used for the example images at right. The original model #0 is now split into model #0.1 containing chain A and model #0.2 containing chain B. Models are listed in the Model Panel (under Favorites in the menu). You can save/restore multiple positions using different names, and positions are included in subsequently saved session files. To save your work at any point, save a session (see the File menu). **These aliases assume the complex is oriented so that #0.1 (trypsin, green) is on the left and #0.2 (inhibitor, purple) is on the right. ** Aliases can be used in the Command Line, and face-me also appears in the Aliases menu; separate does not, because it requires also entering the distance of separation (Å). The “^” symbol means the alias should only be expanded when it appears at the beginning of a command. In the independent rotation mode, each model rotates about its own center rather than a single collective center. You can start over by resetting to the closed position (or whatever you named it). An existing position can be overwritten by saving to the same name. However, don't worry about optimizing the positions for figures yet. The goal at this stage is to simplify opening/closing the interface to evaluate colorings. Any one of the following three methods could be used to identify and color the binding interface. 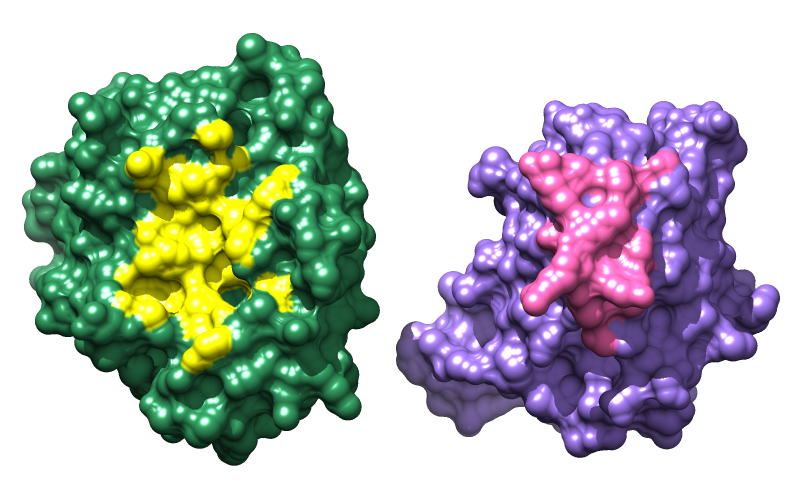 Remember to put the structures in the bound state (closed-interface position) before running calculations, and if trying different methods or parameter values, recoloring the proteins between trials as in the setup. Previous commands can be re-executed using the command history. (Advanced users may be interested in some additional aliases used during tutorial development.) Reset to an open-interface position to see the coloring results. Method 1 (used for the figures) identifies atom-atom contacts with Find Clashes/Contacts or its command equivalent, findclash. In the findclash command, the overlap and hb parameters are adjustable, with values of 0.0-(–1.0) Å and 0.0 Å, respectively, recommended for finding contacts. An overlap cutoff of –1.0 identifies pairs of atoms with VDW surfaces up to 1.0 Å apart. When the command is instead used to find only clashes (unfavorable, too-close contacts), hb values > 0.0 help to exclude H-bonding atom pairs. The two sets of atoms are specified with model numbers (e.g. #0.1), but chain identifiers could have been used instead (e.g. :.a), and if water had not been deleted, the calculation could have been limited explicitly to protein (e.g. #0.1&protein or :.a&protein). Method 2 first calculates buried surface area, then uses the resulting per-atom values (assigned as atom attributes) to identify interface atoms. Method 3 identifies where surfaces are close to one another and does not involve atoms. These commands identify where the surfaces are within 2.5 Å of each other. Again, different cutoffs could be used, but 2.5 gave a result roughly similar to the preceding examples. The specifications in the contact-area command (e.g. #0.1) refer to the surface models, which happen to have the same model numbers as the corresponding atomic structures. It is prudent to save your favorite views as positions, then save a session (and save a session again after incorporating any finishing touches). You can overwrite an existing position or session by using the same name. The vertex density of a molecular surface (default 2) controls the fineness of triangulation, with higher values giving a greater number of smaller triangles and a smoother-looking surface. Of course, many other combinations of effects and coloring schemes are possible. Just to name a few, surfaces could be colored to show hydrophobic/hydrophilic compatibility or electrostatic complementarity as in the Surface Properties tutorial, conservation within associated sequence alignments as in the Sequences and Structures tutorial, or concavity/convexity as in the Attributes tutorial, part 2. A color key and text could be added, as in the B-factor Coloring tutorial. 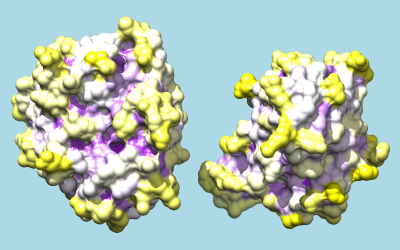 The result shows a predominantly positive protuberance on the inhibitor (right) interacting with a primarily negative pocket on the enzyme (left), with the opposite charge pattern on surrounding areas. The result mainly serves to emphasize what is already evident from the shadowed surfaces: that a knobby protuberance on the inhibitor plugs into a socket on trypsin. The Attributes tutorial, part 2 describes showing per-atom rather than per-residue convexity, but the results are similar.